As close to the real thing as we've yet heard, these three stellar compressors sound really incredible. Amazing compressors. Easy to use. Smooth, transparent response. You can't do better for vocals. Default 4dB gain boost. Default gain differences between models. 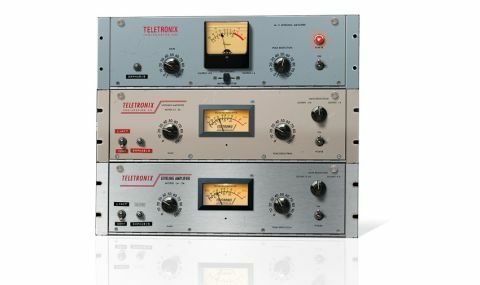 If there's one compressor that can truly claim to be a classic, it's the Teletronix LA-2A. Ask 100 top engineers what their first choice vocal compressor would be, and at least 90 of them would opt for this amazing, almost 50-year-old studio staple. The LA-2A has evolved over the years, and its various versions with their different characters have fuelled debate, dividing opinion over their individual merits. "Universal Audio has modeled three of the most sought-after LA-2A versions and bundled them together"
With the Classic Leveler Collection for UAD-2 (VST/AU/RTAS), Universal Audio has modeled three of the most sought-after LA-2A versions and bundled them together. Advances in emulation technology and the increased processing power of newer UAD-2 systems mean that these supersede UA's original 12-year-old LA-2A plugin, although that is still available in basic bundles as the 'Legacy' model. The three versions in the Collection are the 'Silver' and 'Gray' LA-2As, and the original LA-2. The last was originally designed by Teletronix founder Jim Lawrence in the early 60s using a groundbreaking optical compression technique, characterised by a smooth, nigh-on transparent attack and decay that made it particularly great for vocals. A few years later, he updated the design to the LA-2A Gray, which featured a quicker response time. Universal Audio bought the patent and name in the late 60s and produced the Silver version, which had the quickest response times of all. All three models have essentially the same controls, and using them really couldn't be more straightforward. The Peak Reduction knob lowers the threshold as you turn it clockwise, setting the amount of compression applied. The LA-2 has a fixed compression ratio of infinity:1, while the two LA-2A's offer a choice of 3:1 or inf:1 (limiting) via the Comp/Limit switch. The optical process is slightly frequency-dependent, however, so the ratio can vary a bit with the frequency content of the input signal. Then there's a Gain knob to make up the gain at the output, and an Emphasis setting that can be used to roll off low frequencies in the sidechain. "The Silver is more immediate on vocals, being punchy and transparent, but not as warm as the Gray mode"
Accurately comparing the three models takes a bit of setting up, since UA has cheated slightly with its gain structures to make them sound unrealistically 'better' by default. Unlike its original, Legacy LA-2A plugin, the default settings are all at least 4dB higher than unity; the LA-2 is a good 1.5dB quieter than the Silver, with Gray somewhere in between the two. Once they're all on a level playing field and running the same peak reduction, though, it's easy to hear the differences between them. The Silver is more immediate on vocals, being punchy and transparent, but not as warm as the Gray model. The warmth of the Gray is sublime, but there's much more reduction of the high frequencies, and with its slow recovery it's not so in-your-face. The LA-2 is tonally quite similar to the Gray, but with its slower response, doesn't work so well on a fast vocal, being much more effective on more spacious legato material. Which of the trio is 'best' is down to personal taste and usage, but there's no arguing that they all represent a big step up from the original LA-2A plugin, and it's comforting to know that circuit modeling is now at such a level that the subtle nuances of different versions of the same model are audible. In terms of emulating the originals, we'd have no hesitation in calling the Classic Leveler Collection definitive.